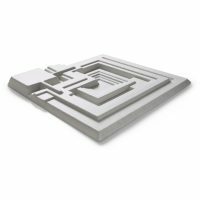 Propsummit.com a Blade Runner Prop Community Forum BladeRunnerProps.comView topic - Replica Ennis House Blocks - in acoustical tile! 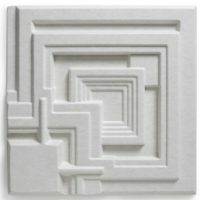 Posted: Thu Jun 14, 2018 4:20 pm Post subject: Replica Ennis House Blocks - in acoustical tile! 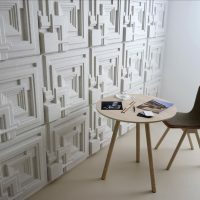 Just discovered that a company in Sweden named Offecct released an acoustic tile version of the Ennis House tile this past February! I believe these may be larger than the actual tiles (these measure 23"x23" - were the originals 16"x16"? ), but were made in collaboration with the Frank Lloyd Wright Foundation so should be 100% accurate as far as detail. They're made of polyester fibers in offwhite, so should look kinda like smooth concrete - I'm unclear if they come with acoustic foam in the back or if these are just hollow shells. I'll post photos once they arrive - both of the tile itself and what they look like installed together as a group in my place. Ordering them was not the easiest - I had to contact a distributor local to me, then generate a PO, then wire money directly to Offecct in Sweden based on the invoice they then sent me. They cost me $100/ea, so no great deal, but I expect they will look great in person. I was told there is no minimum order. it seems the textile filling inside is an option. TFS with us BenderDavid Tiles are accurate (of course, they worked directly with FLLW Foundation)...and yes, the originals are 16"X 16".